We have been working hard to improve our diet in many ways. This includes eliminating process foods from our kitchen, eating a mostly plant-based diet, and incorporating more fermented foods into our daily meals. Fermented foods such as kefir (both milk and water), buttermilk, sauerkraut, yogurt, and kimchi are easily incorporated into your weekly meal plans, and provide a number of health benefits. Fermented foods help balance the production of stomach acid, help regulate pancreatic function, and produce compounds that that destroy and inhibit negative bacteria. They improve gut health and help prevent digestive problems. 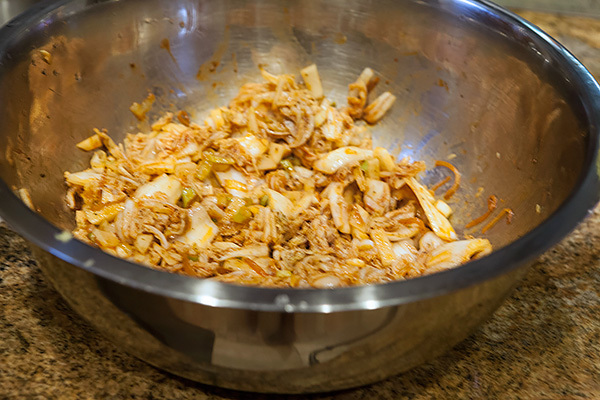 Kimchi is a traditional fermented Korean side dish made of vegetables, mostly Napa cabbage, with a variety of spicy seasonings. 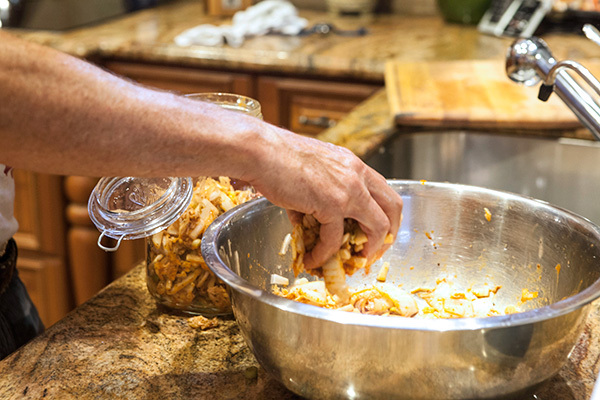 We started to make kimchi last year and have made it several times since discovering just how easy it is to make at home. The best part about making your own kimchi is that you know exactly what it is made of, and you can control just how spicy you like it. Kimchi can be used to flavor a variety of dishes, and we are always finding new ways to incorporate it into our meals. 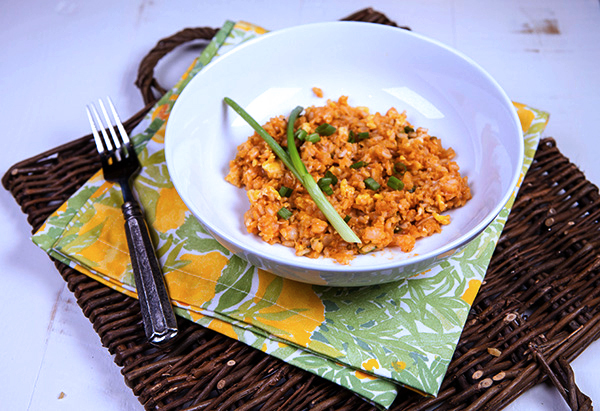 One dish we now enjoy frequently is this kimchi fried rice. You can keep it simple and vegetarian by only using eggs, or you can add shrimp as I have, or even diced chicken or pork. 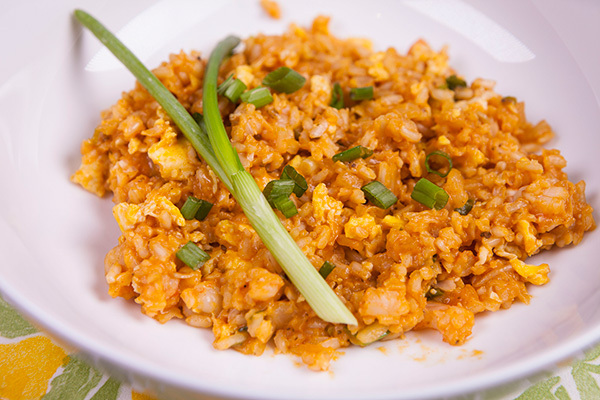 To make this dish a little healthier, I chose a whole grain brown rice rather than the traditional white jasmine rice. Kimchi is prepared and ready to be placed in a jar to ferment. 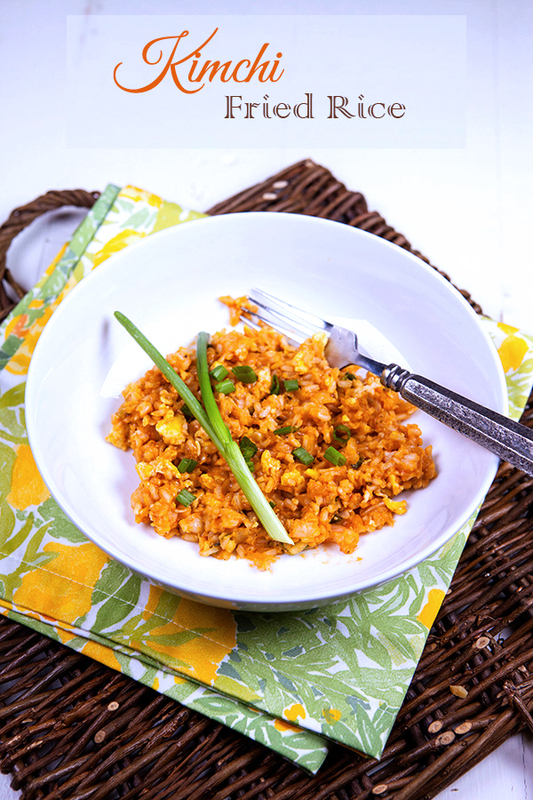 Brown rice replaces white adding whole grain nutrition to this dish. Kimchi is a fermented cabbage flavoring that helps to maintain and improve digestive health. Pour 2 tablespoons oil to a large frying pan or wok, and over medium heat cook the shrimp, stirring frequently for a few minutes until cooked through. Add the whites of the scallions (reserving the green part) and cook 1 to 2 minutes. Next add the kimchi and chili paste and cook 3 to 5 minutes or until the kinchi softens. Spoon the rice into the pan, along with the sesame oil, soy sauce, salt and pepper. Cook, stirring frequently until the mixture is blended and the rice is hot. Stir in the scrambled eggs along with the reserved green part of the scallions.